The idea of “1x” drivetrains is running just a single chainring with a rear derailleur and multispeed cluster, and it isn’t new to cyclocross. The classic cyclocross course just doesn’t require a wide gear range, and indeed singlespeed CX riders often compete on equal footing with their fully geared comrades. Besides the lighter weight of one less shifter and derailleur, there is the potential to have fewer bits to collect mud and debris from the race course. However, one cannot simply remove half the drivetrain from a cyclocross bike without repercussions. In absence of a front derailleur, chains have a tendency to pop off the ring when the bike is bouncing or when the rear derailleur is positioning the chain at the extremes of the cluster, effectively creating bad chainline angles. Decades ago Campagnolo made 144mm bcd chainring guards for their Nuovo Record to be fitted on both sides of a single chainring. This worked well to keep the chain on the ring with the narrow overall, physical width of 6sp freewheels, but a wider bottom bracket spindle (and thus pedal stance) was necessary to allow enough room for the inner guard and the chain stay. Since then many individuals have made their own guards simply by grinding the teeth off of a worn chainring slightly larger than the one to be used. 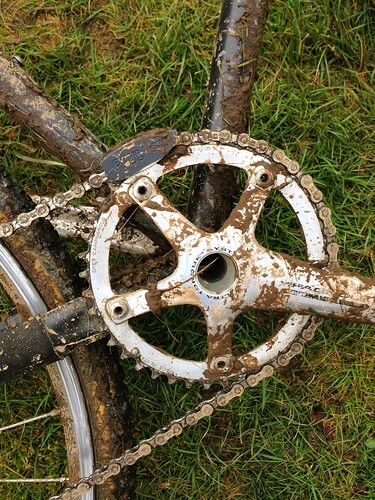 It is common to see cyclocross riders using a chainring guard in the outer position of a double crank, the single chainring on the inner position, and a chain catcher/deflector to keep chain from falling off to the inside. Various such plastic or metal chain catchers/deflectors have been sold over the years for both road bikes and mtn bikes. A chainring guard combined with a deflector can be a very reliable combination for a 1x drivetrain if you’re considering it, but a feature used in SRAM’s innovative mtb gruppo XX1 has generated much interest from cyclocross riders. One key feature of XX1 is the “X-Sync” chainring, which has tall teeth that alternate in thickness between standard width and something rather thicker. The thicker teeth are too wide to fit the chain at the links formed by inner plates but exactly fit inside of the outer links. This reduces the chain’s lateral freedom of movement on the ring, keeping the chain from derailing from the ring without any sort of guide or deflector. While SRAM-sponsored riders have been seen using prototype CX-versions of the XX1 chainring, AbsoluteBLACK and Wolf Tooth Components have already made similar rings available to consumers. Based in the UK, AbsoluteBLACK currently makes 38T & 42T CX rings in either 110mm or 130mm bcd. I chose the 38T to replace the 44/34T double chainring on my Redline Conquest Carbon. 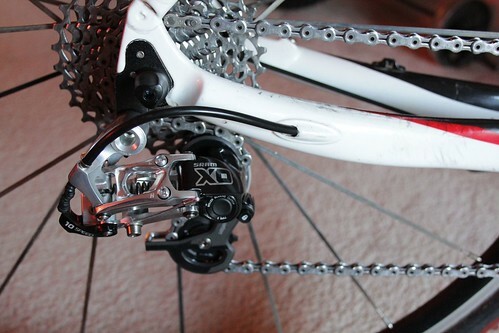 I also chose to replace the SRAM Red rear derailleur with an X0 “Type2” mtb derailleur. Type2 rear derailleurs have a roller clutch mechanism in the pulley cage pivot, thus the pulley cage will not easily move in response to a brief forces such as the chain’s tendency to bounce as the bike slams across rough surfaces. However, the cage will pivot smoothly from a sustained, continuous force such as when you shift onto a larger cog. The XX1 gruppo depends on a Type2 derailleur as well as the tooth profile of the ring to reign in the chain, so it’s a natural that a Type2 derailleur would help for cyclocross application. However, Type2 derailleurs are only an option for 10sp SRAM shifters. There is no roller clutch derailleur compatible with SRAM’s Red22 or Force22 levers (ie 11sp), nor with any Shimano or Campagnolo dropbar levers. Much as with their XX1-style CX rings, SRAM does have sponsored pro riders using 11sp roller clutch prototypes for dropbar levers, but there has been no official comments, much less release dates. It’s at this point that I would like to make official my opinion of 11sp: it’s f***ing stupid. I’ll make an exception for SRAM’s 1×11 mtb gruppos, because the 11sp super wide-range cassettes (10-42T) make single chainring setups viable on a mtb. But I categorically denounce any multiple chainring 11sp gruppo, most definitely including Red22, Force22, Ultegra 6800, Dura Ace 9000, and any Campagnolo 11sp gruppo. And when it comes to cyclocross…with its stereotypical abuse to drivetrains…1×10 is most definitely all the gearing you really need. If you are building up a bike piece by piece, stick to 10sp. If you are buying a new complete bike, 11sp is in the “cons” column not “pros”. I could go on and on about why I hate 11sp drivetrains (with a very specific exemption for SRAM’s 1×11 mtb gruppos) , but I was talking about CX chainrings here. However, if you must use 11sp, both Wolf Tooth and AbsoluteBLACK chainrings are designed to work with 10 or 11sp chains (in fact, they will not work with 9sp chains, so use a 10sp chain if you want to make a 1×9 setup). Even with the Type2 derailleur and AbsoluteBLACK chainring, you’ll still want to shorten the chain to just the right length to make sure there is no slack to allow the chain to come off. Unfortunately that complicates things if you were planning on running different cassette/chainring combinations depending on the course. 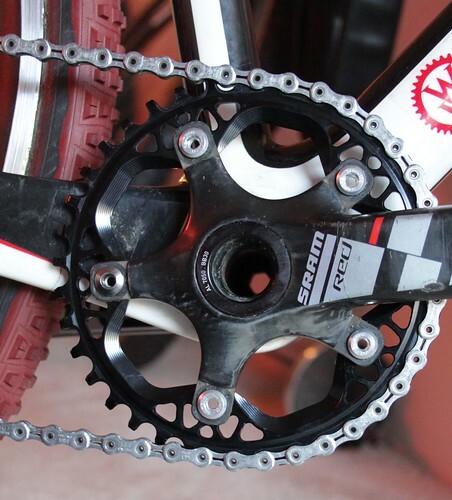 You might need to keep separate chains for different cassette/ring combinations. In the future, I plan to use the same 38T ring with either 11-28 or 11-32 cassettes, each cassette with its own chain. The 11-32 cassette is wider than what I ran on my previous double chainring setup, so that I more or less have the same lowest gear with the single chainring. Besides having a roller clutch for greater security, the X0 derailleur can also fit a bigger cassette than the road derailleur it replaced. During the Seattle CX’s finale at Enumclaw, the AbsoluteBLACK ring was perfectly unnoticeable. I never thought about it in the race; it just did its job. 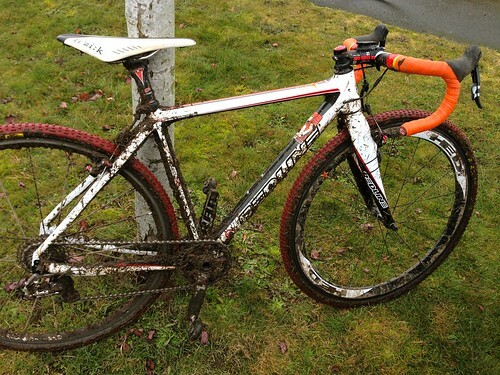 The course was muddier than I had expected, and there was a fair bit of grass buildup on the bike. You can see from the photos how much it caked onto the BB area, but the chain never wandered from the ring. If anything, I was a bit worried about the grass build up on the derailleur pulleys, which by the end of the race were definitely encumbered with wet flora and earth. Indeed, there were a number of derailleur casualties that day, the seized derailleurs ripping off the frames, but I rather expect the X0 derailleur to be a little less vulnerable. Through it all the X0 shifted with a firm confidence, perhaps due to the heavier springs, and I don’t think it was any more prone to mucking up than road derailleurs. Another feature of the X0 that I liked was that the cable entry path suited my Redline Conquest frame quite well. The Conquest’s internal cable routing exits the chainstay 8cm from the axle, putting it on a perfect, low profile path to the X0 derailleur. To compensate for the derailleur’s lack on integral barrel adjuster, I installed a Jagwire inline adjuster on the housing near the handlebar. In my opinion, this ideal for cyclocross as a contact sport, but the internal routing of some frames, such as the Specialized Crux, exits too close to the axle to allow a gentle housing radius to a typical mtb derailleur. I would conclude that my 1×10 cyclocross setup was a success. With the AbsoluteBLACK chainring and roller clutch rear derailleur, I had built the best theoretical combination, and the performance seemed to validate. I’ve seen greater mud & grass build up, but not too much worse. 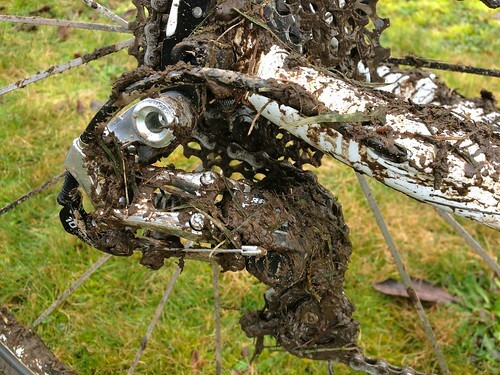 The manufacturers warn that in extremely sticky mud the chain could still come off, even though the Type2 derailleur does give a little extra insurance. In really ridiculous conditions, it is recommended that you add a chainguide, which is something like stationary front derilleur. Such chainguides are marketed by Paul Components and MRP. The downside is that it’s added weight, and the guide itself becomes an appendage that collects mud, which somewhat defeats the purpose of running an XX1-style chainring in the first place. If I was going to run a chainguide, I’d just as soon use a super cheap chainring and not worry so much about my chain length. I could buy 3-4 cheap chainrings of various tooth counts for the cost of an AbsoluteBLACK, thus giving me a quiver of chainring sizes to suit different course profiles. In practice, I don’t really worry too much about gearing, so I’ll be keeping my current setup with a 38T ring. If you’re looking for something other than a 38 or 42T XX1-style ring, AbsoluteBLACK has plans to add more chainring sizes, but Wolf Tooth already offers 36 to 44T CX rings. I’d say that an XX1-style chainring should give the best weight savings and mud clearance for any 1x drivetrain, while combining it with a roller clutch rear derailleur should secure the chain in all but the very worst conditions. A chainguide with a small selection of cheap standard rings would allow a rider to fine tune the gearing for a course; adding a roller clutch derailleur and XX1-style ring to the chainguide should secure the chain maximally. A chainguide might be the only off-the-shelf option if your crank is Campagnolo or has another uncommon bolt-circle diameter. The cheapest 1x option might be making a chainring guard from a worn out chainring and using a cheap plastic chain deflector. However you choose to make your 1x, if you choose your chainring size and cassette ratio well, you will never miss having running a double crank. You’re running a Campgnolo crankset? 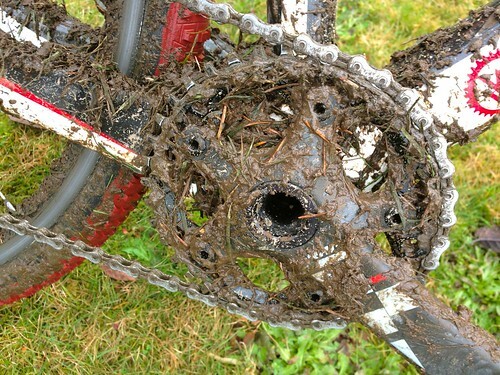 Well, no XX1-stype chainring for you, and you’ll have a hard time finding a chainring guard too. If you want to build a 1x drivetrain, use a chainguide like this one from Paul. 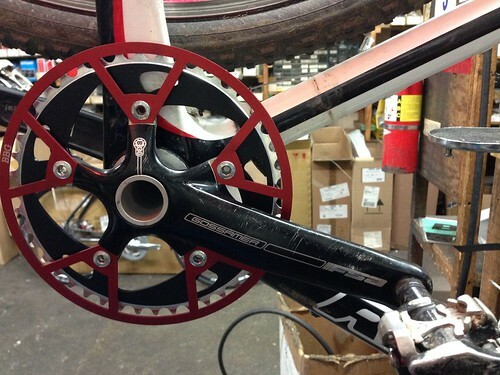 Below is a chainring guard. The chain deflector hasn’t been installed yet.